This illustration depicts the aged King Arthur being presented with the Holy Grail by his loyal Sir Galahad. 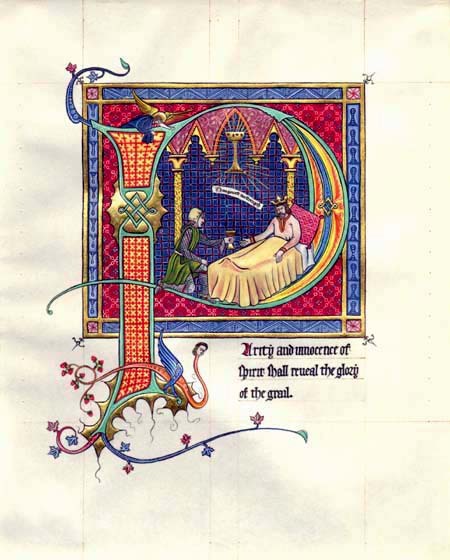 The Text begins with a large decorated initial "P" to read "Purity and innocence of spirit shall reveal the glory of the Grail." The banderole (medieval scroll shaped "cartoon balloon") reads "Thou givest me strength." This painting contains many medieval pigments that are rarely if ever used today, including real 23k gold leaf on 14th c Italian type adhesive, malachite, azurite, real vermilion, minium, and orpiment.